Aimersoft Video Editor is competitive software for Wondershare Filmora. And Aimersoft Video Editor license key also available for free. Like other Aimersoft giveaway, it also time limited offer. And the good news, the vendor offer unlimited number of license key for Aimersoft Video Editor on this offer. 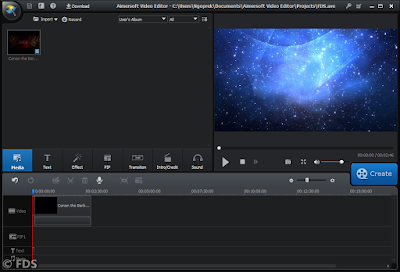 Aimersoft Video Editor also know as Video studio express the easy to use video editing software. All tool you need to edit video available on this software. Aimersoft Video Editor let you create eye-catching movies in a few easy clicks. There is more than 50 transition effects & component you need to create awesome video. In this time-limited giveaway everyone can get genuine serial license key for Aimersoft Video Editor. If you are interested, visit the giveaway page. 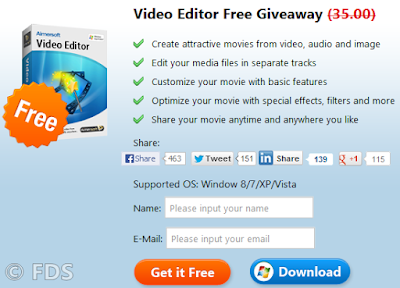 Aimersoft Video Editor Giveaway page: Visit the page! Only requires three simple steps to download Aimersoft Video Editor with genuine license on this offer. Save $35 by downloading the software. Visit the giveaway page above to download the software with genuine registration code. Fill up the online form or enter your name and valid email, then submit by clicking “Get it Free” button. The license key will be sent to your email. Check spam folder if doesn’t receive the key after 10 minutes or request new license. Download the installer Aimersoft Video Editor on your email and use the serial license key to activates. The software is powerful tool for professional users.